…which attracted MSM ridicule, has a basis in fact. Trump had previously claimed that Pershing had his troops dip their bullets in pig’s blood. There is no evidence Pershing ever ordered this, but there is some evidence that it did happen without orders. 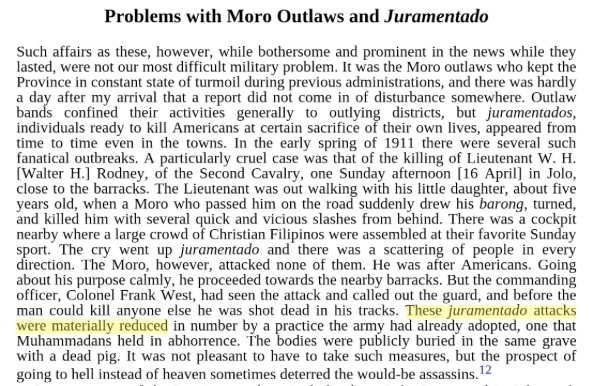 In any case, I think burying Moros with pigs counts for something. The fact that Pershing didn’t claim to have ordered such burials is irrelevant. Colonel West was his subordinate. Pershing regrets the necessity, but he didn’t bring Colonel West up on charges. The MSM keeps forcing people to defend Trump. Not to say that when Trump makes an incendiary comment that he shouldn’t be exquisitely precise, but if a Dem had said this the MSM would have located the quote above as exculpatory. Of course, the Tweet itself didn’t even make the questionable claim, as evidenced by the words “seemingly” and “apparently” in the ABC report.